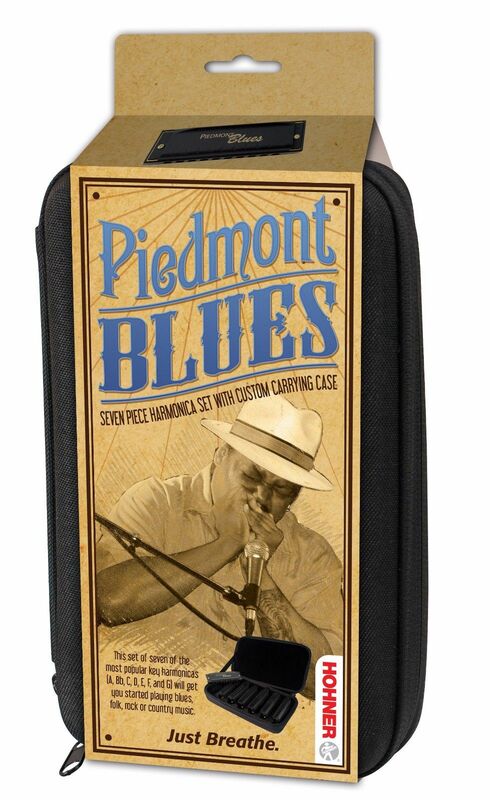 The Piedmont Blues is an affordable yet durable harmonica made to perform. Available exclusively in a set of 7 keys of A, Bb, C, D, E, F, and G with a custom neoprene carrying case. This set enables you to accompany music in all 7 of the most popular keys. Named after the diverse Piedmont plateau area on the mid-atlantic to south-eastern regions of the United States, Piedmont Blues style was influenced by ragtime, country string bands, traveling medicine shows, and popular early 20th century songs. The Piedmont Blues style is differentiated from other blues styles (particularly the Mississippi Delta style) by its up-tempo ragtime-based rhythms. Throughout the history of Piedmont Blues, HOHNER harmonicas have been found at the heart of this musical style in the hands of players like Sonny Terry, whose sophisticated sense of rhythm is still a marvel to behold. Today, it is best represented by master of the genre Phil Wiggins, who has performed everywhere from Carnegie Hall and the White House to stages in China and Africa.